NSF Contacts to Outlook Express! All your searches of Notes to Outlook Express converter ends here because now we have brought for you software which can easily convert Lotus Contacts to Outlook Express in only few minutes and gives a error free migration. It is the very effective tool which ever up to date in its technology. This Software exports Lotus Notes address book or contacts (names.nsf) to CSV File. Software support to Notes Contact Migration which created using mail Clients 8.5, 8.0, 7.0, 6.5 & 5.0. This upgraded tool lets users to export Lotus Notes contacts to CSV file, and then user can import the CSV file to Outlook Express to view the contacts list and can easily operate on them. It is a quick Notes address book conversion tool as it converts or exports all your Notes Contacts information including Business, Personal, Briefcase, Advance. 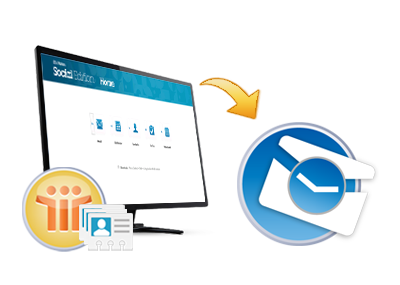 The tool helps converting Lotus Notes contacts to Outlook Express Address Book. Multiple contacts from names.nsf can be exported along with associated contents such as contact information and business details. Once the file is selected, it will start scan and extracts all contacts information from Lotus Notes contacts file. The preview is then generated for all the contacts incorporated in the file within tool window. The Notes Contacts to Outlook Express converter tool lists all contacts encapsulated in names.nsf in alphabetical order from A to Z after scanning the file. Any particular contact can be expanded by clicking on the alphabet. The contacts conversion tool exports all Lotus Notes contacts into CSV file. All the associated fields are stored in the form of cells and columns in CSV file that can further be imported into Outlook Express application. It offers user to export selective fields or attributes from the given list. The fields can be selected by checking\ unchecking the checkboxes associated with them. By default, the tool will export all the fields. The tool comes with simple GUI and is easier to use for even non technical users as it does not require any expertise. The conversion process can be implemented by following the self defining steps carefully. Does this software support all Editions of Lotus Notes? Yes, Notes Contacts to Outlook Express Software easily convert contacts from any version of Notes. Does this tool convert bulk Contacts from Notes at a time? Yes, Notes Contacts to Outlook Express tool convert multiple contacts from names.nsf file to Outlook Express simultaneously.